For our 61st annual meeting, the Western returns to the Grand Hyatt Resort and Spa on the Hawaiian Island of Kauaʻi from September 10-13, 2015. Our first vist to this lovely venue was in 2011 and the attendee feedback was so positive that a return was arranged. Direct flights to the Lihue airport on Kauai (17 miles from the resort) are available from many major airports or you can always fly to Honolulu and take the short flight to Lihue. If you’ve never explored this unique island then renting a car is worth the expense but if you did all that in 2011, then a shuttle from the airport to the Grand Hyatt is available but must be scheduled before arrival (https://speedishuttle.com). 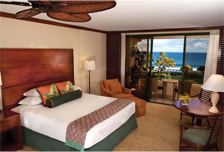 The resort room fee for WNS members is $235 for a garden view and $285 for an ocean view and each room has all the expected amenities including a private lanai. Resort fee is $26 a day and includes simple (no big data or streaming video) in room internet access.